The BURP Real Ale Competition and Festival is held each year in November, a time of year that features moderate temperatures during the day and cool nights, conditions which aid in the conditioning and drinking pleasure of this unique style of beer. The first BURP Real Ale event was held in the Fall of 1997. The BURP Real Ale event remains, to the best of our knowledge, the world’s largest Real Ale event comprised totally of homebrewed (vs commercial) Real Ale. Real Ale is the name coined by England’s Campaign for Real Ale (CAMRA) in 1973 for a type of beer defined as “brewed from traditional ingredients, matured by secondary fermentation in the container from which it is dispensed, and served without the use of extraneous carbon dioxide”. Traditionally, British brewers ferment these ales to near completion and then transfer them to casks (originally wood but now stainless steel or food-grade plastic). After the beer is transferred, finings (yeast settling agents) are added to clarify the beer once the fermentation completes. The last bit of fermentation produces the relatively low level of CO2 required for the final product. Properly conditioned Real Ale is normally served at cellar temperature (around 55º F) and should be crystal clear in appearance with light carbonation. Since many ales produced in this style are also relatively low in alcohol (at or below 5% ABV), they are ideally suited for consumption over an extended period of time in the social setting of the English pub (hence, the term “session beers” – those consumed during a drinking “session” with friends and family at the pub). Real Ales are traditionally served by gravity dispense (through a tap inserted directly into the cask) or pulled from the cask using a hand pump (also referred to as a “beer engine”). BURP members began traveling to the UK to enjoy these beers relatively early, from the 1980’s on. At the time, homebrewers were just starting to use Cornelius kegs to store and dispense their beers, and techniques used to carbonate homebrew in the keg (fermentation to completion and then re-fermentation in the keg using a sugar or malt extract addition) generally followed UK Real Ale guidelines (i.e., no extraneous CO2 added). Some club members also began experimenting with traditional techniques of fermenting to near completion and then transferring to the keg with finings added. 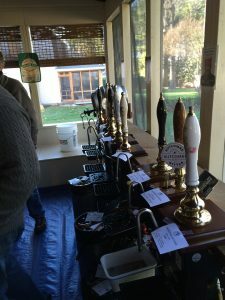 The first BURP Real Ale Competition and Festival was held to highlight this type of beer and enlighten club members on its unique qualities and the techniques required to brew and serve it properly. 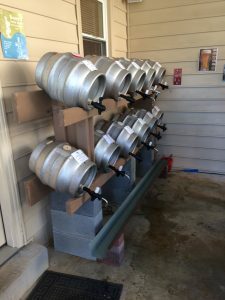 The BURP Real Ale Competition is registered with the Beer Judge Certification Program (BJCP) and is open to all homebrewers, regardless of club affiliation. The competition itself is held on a Friday evening and is open to invited judges and stewards only. Entries are accepted in either corny kegs (3 gal or 5 gal) or traditional casks (5 gal pins preferred, but 10 gal firkins are accepted if appropriate stillage is also provided). A minimum of 2 gallons of beer must be provided to enter the competition. Those entering traditional casks must also provide a tap and both a hard and soft spile. All beers entered in casks are served by gravity dispense. Entries provided in corny kegs are served using traditional English beer engines (kindly loaned to the event by BURP members and other Real Ale devotees). Entrants need only provide an appropriate ball-lock or pin-lock gas-in fitting for each keg entered (which allows for air to be drawn into the keg during dispense – a critical part of the Real Ale experience). It is advised that entrants put their name or initials (or any other identifying symbol) on the fitting to facilitate its return in case it is separated, and it is helpful to tie the fitting onto the top of each keg entered with a piece of string. Real Ale staff do their best to insure that fittings are returned to their owners after the competition. The BURP Real Ale competition is a celebration of traditional British, Irish, and Scottish cask conditioned beers. 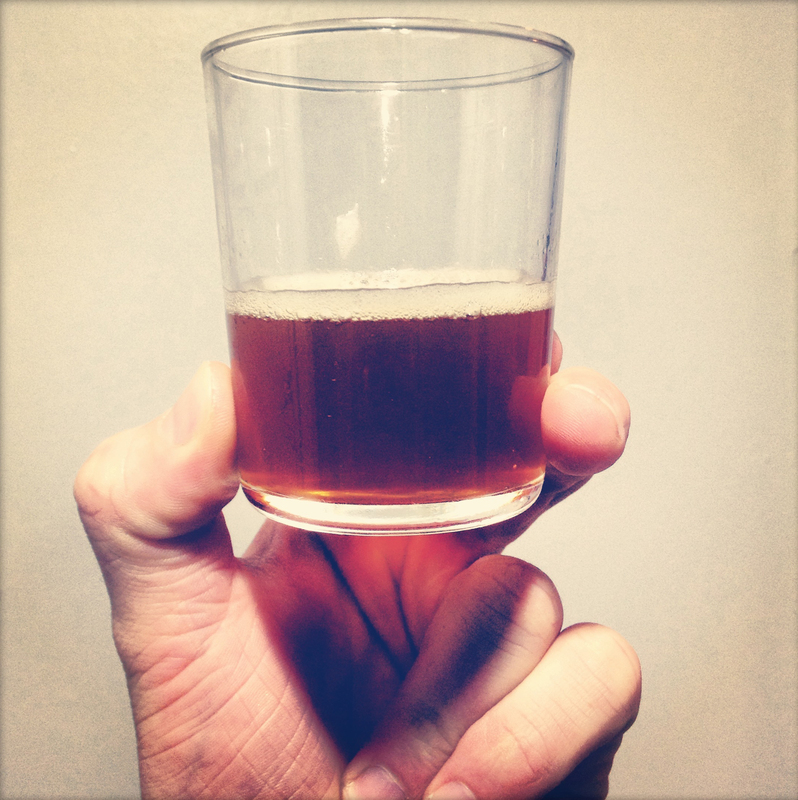 The currently accepted styles of beer for the competition are based on the latest 2015 BJCP style guidelines. Please see the BJCP 2015 Style Guidelines for full listings and explanations of these styles. Entry registration for the competition is done online and is available through a link on the BURP calendar. This helps the club prepare storage space, dispense, and stillage for the appropriate number of kegs and casks expected for the event. Entries are accepted onsite at the competition venue beginning the Sunday before the competition. There is no cost to enter the competition and no limit to the number of beers a brewer can enter. Following CAMRA guidelines, only naturally-carbonated beers are accepted – no force carbonation using extraneous CO2 is allowed. It is recommended that all entrants submit their beers a few days before the competition in order to allow the beer to settle and clear, but entries are generally accepted until noon on the day of the competition. The club’s crack team of BURP cellarmen/women will adhere to any conditioning directions given them, but in the event that no directions are given, they will do whatever they feel is best for the beer. All beers are judged according to their quality as well as their adherence to the style guidelines. BURP prides itself on recruiting the most knowledgeable Real Ale judges from within BURP and the professional brewing community. Each entry receives feedback. Ribbons are awarded for first, second and third places, and the overall winner also receives the coveted BURP Champion Real Ale pewter cup. Also, by long tradition, there is a special “Cellarman’s Choice” award presented to the beer deemed by the competition cellarmen/women and competition stewards to be “the best beer in the competition which did not reach the Best of Show table”. All beer remaining after the Friday competition is made available to BURP members for tasting at the Real Ale Festival held the following day. Because there is always plenty of beer available, it is not necessary for members to bring beer to the meeting. However, the normal BURP meeting requirement of “bringing more food than you can eat” remains in effect. Because this is a major BURP event, it is open to BURP members and their registered guests only. Members wishing to bring guests need to send an e-mail to the hosts at aaronridge@comcast.net. All guests will be provided with stick-on name tags and will be approached by club officers and encouraged to join the club. Beers served from traditional casks on gravity dispense will be made available all day until casks are emptied. However, because there are insufficient beer engines to serve all kegged entries concurrently, there will be two shifts, with half of the entries on dispense at each shift for 2 ½ hours. Following the 2nd shift, all remaining beers will be made available until the kegs are emptied (or taken home by entrants). The festival begins at noon with an educational session on Real Ale. Beer is made available for drinking at this time. Full details on the festival, including directions, parking, ancillary events, and volunteer opportunities are provided to members just prior to the event. Volunteers in particular are always needed to help check in members and guests on the day of the festival. Anyone willing to help out should contact the hosts at the e-mail address above. A call for beer engines is also sent out separately prior to the event.